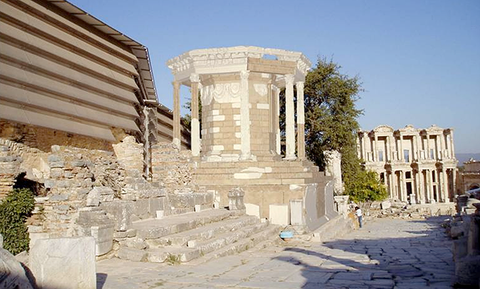 The Octogon was discovered in Ephesos in 1904 at the Embolos in the very center of the ancient city. Originally, it was considered to be a victory monument, but after the discovery of a grave-chamber in the base of the monument with a sarcophagus and the remains of a young woman discussion started whether this is the mausoleum of Arsinoë IV, the sister of Cleopatra, who died in Ephesos in 41 BC. Virtual reconstruction of the Octogon at the Emblos in the center of Ephesos (source: http://baugeschichte.tuwien.ac.at/Octogon/index.htm). 23 samples from the rising architecture as well as 2 samples from the vault of the gravechamber and 1 sample from the sarcophagus were investigated. 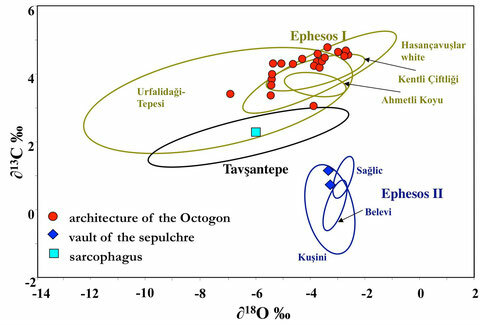 The isotopic composition of the marbles of the Octogon clearly shows that all marbles used for this monument are of Ephesian origin. All marbles of the Octogon are of local Ephesian origin. The samples from the rising architecture belong to the Ephesos I group which occurs in several quarries in the NE of Ephesos. The 2 samples from the vault of the gravechamber are of Ephesos II type marbles probably from the Kusini quarry in the NE of Ephesos. 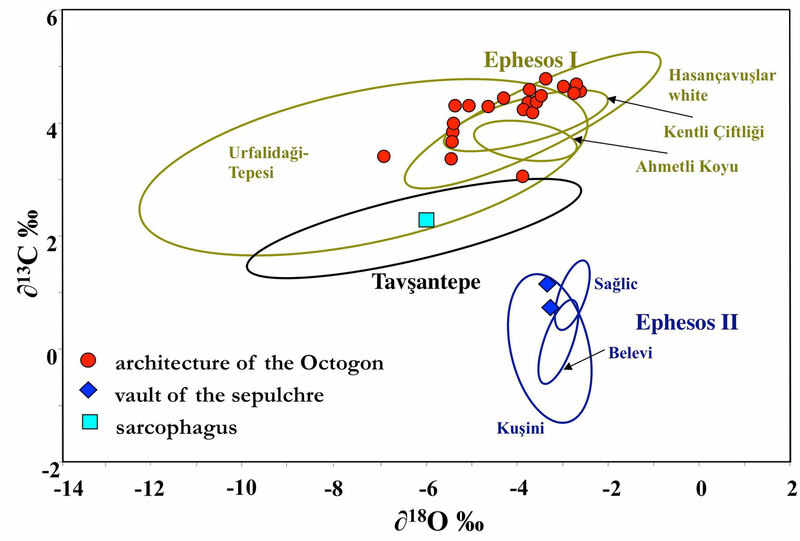 Chemical and petrographic characteristics of the marble of the sarcophagus very well match those of the Tavsantepe quarry close to the city of Ephesos in eastern dircetion. Fragments of unfinished or broken sarcophagi can still be found there.